Going to different baseball stadiums is my favorite thing to do in life. My unattainable goal in life is to visit every standing baseball stadium where professional baseball has ever been played, yes, even Japan, Austalia, or anywhere else in the world. I don’t only enjoy going to active stadiums, vacant (“dead”) ballparks are actually my favorite to check out. I’ve driven far of the beaten path to visit a few old slabs of concrete that hasn’t hosted professional baseball in decades. There are, likely, and immeasurable number of these stadiums in the world, a never-ending goal. A more tangible mini-goal would be visit all the active ballparks under the MiLB umbrella. One of the things that makes this goal challenging is that new ballparks open every year. And for each ballpark that opens, another one closes, becoming another dead ballpark. So a new field opening not only means there’s another one I’ve yet to visit, it also means one falls of this list of active ones I have visited. Hello, Biloxi and Hillsboro. Good bye, Huntsville and Yakima. I didn’t include the rookie-level Gulf Coast and Arizona Leagues or the Arizona Fall League, because those just get complicated. A couple of years ago, I realized, I’d been to a lot of ballparks. So I decided to sit down and make a list. I’ve worked in baseball, had a couple of jobs that had me travel a lot, and I’ve been fortunate to enough to be able to travel for personal reasons. I added six more stadiums on my most recent trip to the Midwest in May 2016 and I’m sitting at a fat 94 now, six parks away from triple digits. Here’s the caveat to reading this. If the ballpark has an asterisk (*) next to it, that means I did not actually go to that park while it was inhabited by a professional team. For example, Engel Stadium in Chattanooga closed in 1999. I didn’t get to Chattanooga until 2001, so I missed going to a game there, but I did drive to it and take a tour. It get’s an *. Any other ballparks that say “former home of” but don’t have an asterisks, I actually went to that stadium while a pro ball team was there. I’ll probably update this list as I add new ballparks. How many you got? A few months after writing out my comprehensive list of professional ballparks I’ve visited, I went to a Tampa Bay Lightning game at the Amalie Arena in Tampa. It made me wonder how many sports facilities I’ve been to, besides baseball. I’m only going list places where I’ve seen actual game and I’ll organize it by sport, league, and team, instead of state and city. I decided to sit down and make a comprehensive list of all the professional baseball parks I’ve been to in my lifetime. 80 is my number, if I counted right, I don’t think I missed any. I’m sure to bump that number up a little, this summer. Hopefully, I’ll make it to Tampa and Clearwater soon. I’d also like to stop by a couple old, out of use parks in the area, namely, Tinker Field in Orlando. It’s been too long between blog posts, folks, and I sincerely apologize. As much as I wanted to beat the odds and write during baseball season, it just wasn’t too high on the priorities list. I’ve also wanted to write about how terrible the offseasons are for me, but to tell you the truth, it’d didn’t start getting undeniably brutal until the last couple of weeks. I promised a few people I would write about my job search this offseason, as I refer to it, clubbie free agency, but I wanted to wait until that process was one hundred percent finalized. The process was finalized at approximately 10:20am on Monday December 19th. I’ve been the home clubhouse manager for the Birmingham Barons, the AA affiliate of the Chicago White Sox, for the past three seasons. It was a good job with some great perks in a fantastic city that I’ve grown to call “home.” But, sadly, it has drawbacks and hardships and isn’t a place that I could possibly spend the rest of my career, or even afford to continue my career. I should have looked for other clubbie work sooner, but I’ve been loyal to my staff and players, and like I said, I’ve fallen in love with the city. The last two offseasons have been difficult for me. I’d have a little chunk of change left after the season, but I’d still have to find a low paying offseason job for a few months. Then, by November or so, I’d be struggling so bad that I’d have to find a second low paying offseason job to make ends meet. Not the best way to live. My dream job is to work at some teams spring training complex. There’s no offseason at those places. Between mini camps, spring training, the regular season, instructional league, and all the other fun activities that go on there, it’s eleven or twelve month baseball work. No crappy offseason jobs necessary. I applied for a complex job that I found posted on MLB.com. The money was great, the job sounded amazing. I exchanged emails and phone calls with the people in charge and eventually had a great interview. In the time between seeing the job posting and hearing the results of my interview, I was offered another job outside of baseball. The restaurant that I’ve worked at the past three seasons offered me a very well-paying management gig. I worked in restaurants for a long time before getting back in baseball. I’m pretty much completely burned out on restaurants, but a stable job that paid well and was close to home was a solid back up plan. I decided if I didn’t get offered the complex job, I was going to hang it up, and take the restaurant job. So…… I didn’t get the job, the team promoted from within. Word went up the corporate restaurant ladder that i wasn’t hired and they gave me some pretty good pressure. But I couldn’t do it. I was pretty close, but I had a lot of great people talk me out of it and talk me into continuing to pursue my baseball dream. I spent the next few weeks, sending emails, tweeting, calling, and texting everyone I knew, to see which teams had openings where. I was constantly checking the online job boards, then checking my email. I found a few jobs that I liked and was told that a few other great jobs were not going to be open. One conversation with another AA team in a different league was going well. It was for a visiting clubhouse manager position. The job description and pay seemed great. I know a few people who had been to the town. Their reviews where that it was a decent to great place to be. I also know the home clubhouse manager for the team. He gave me the run down on everything, it seemed like a pretty sweet gig. I was pretty enthused. The interview process was awesome and the team made a great offer. There were a couple of minor details needed to be worked out, but they offered and I 99% accepted the job. The following day, however, I received a reply to an email that I had sent prior to finding out about the above job. The email was from the Tampa Bay Rays, whom I had emailed asking about possible openings at their Florida complex in Port Charlotte. The gentleman told me that the Port Charlotte position was not available, but the home clubhouse was open at their AA affiliate, the Montgomery Biscuits. I had to tell him “Thanks but no thanks.” I politely told him I already had a great deal in place, and I wouldn’t want to back out of it unless I was offered a job at a complex. He said he understood and appreciated my loyalty,…….. then he gave me more details about the job. It was very comparable to the other job I was offered, actually, it was a little better. AND, it was close to home. Montgomery is about an hour and a half from my house, and two and a half hours from my son. The other job was more than ten hours away. I was really leaning toward Montgomery being the job that I wanted. I emailed the president of the Biscuits after the Winter Meetings, and we met at the ballpark a couple of days later. We had a great conversation, I met some great baseball people, and I got the complete tour of the ballpark and all the details about working for the Biscuits. Pending a background check, they wanted me for the job, and I wanted the job. I got the phone call at 10:20 am on Monday December 19th. The background check checked out, they formally offered me the job, and I formally accepted. This is definitely a good move for me. 1. Spring Training – Most major league organizations bring their minor league clubhouse managers to spring training, but some don’t. Spring training is our chance to network and show our skills to the bigwigs of that organization and even other organizations. If a job did not include spring training, it was automatically eliminated. I’m not going to spin my wheels in place anymore. 2. Location – I mentioned that Montgomery being close to home was huge for me. But being close to home don’t totally encompass what I mean by “location.” Entertainment options, weather, and proximity to fun stuff also were factors. For example, I was playing on Mapquest, doing a little research on two jobs that I was interested in. One job, was 3-4 hours away from the nearest bigger city, that could have made for a long boring summer, AND offseason if I was planning on moving. Mapquesting the other job, I found there were 13 other professional ballparks within a two and a half hour radius. How much fun would that have been to see thirteen or so new ballparks in one summer!? 3. Money – It’s harder to gauge how much money you’ll be making with clubhouse jobs than most other jobs that exist. First, there’s the salary. In addition to that, the major league teams usually chips in some cash to cover various expenses. From what I hear, those amounts vary from $30 to $150 per game. What the minor league affiliate covers varies from team to team too. Some teams cover Powerade, dugout cups, replacement shower towels, shower soap, shampoo, or even furniture or any combination of those items. Those costs are covered by the clubhouse manager with other teams. I know of one team that doesn’t even provide laundry detergent for the visiting clubhouse manager. Outrageous. Both the Rays and the Biscuits appear to be very generous. But even after accepting the job, I was told of a substantial check that I’d be getting from the Rays to help cover costs. Bonus. 4. Ballpark and clubhouse – This encompasses a lot of things. Ballpark atmosphere, location and proximity to stores and restaurants, as well as clubhouse size, amenities, and maintenance. 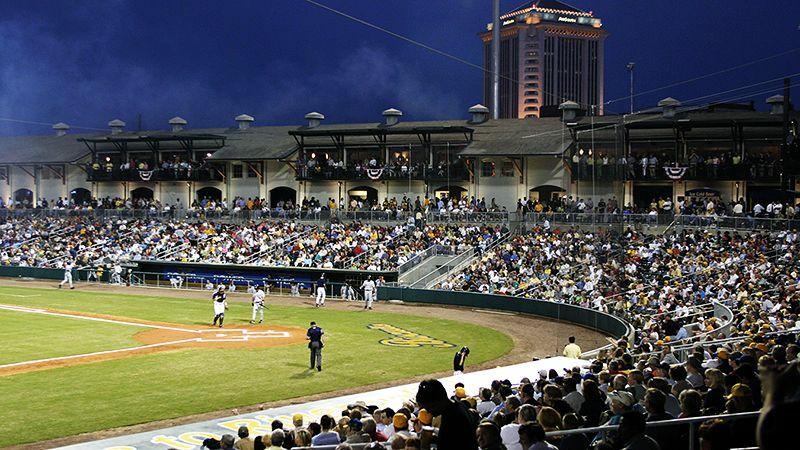 Riverwalk Stadium in Montgomery is my favorite ballpark in all of MiLB because of its beauty and fantastic atmosphere, but the downtown location that’s 15 minutes from a grocery store and having to park 1/4 of a mile from the clubhouse honestly terrifies me. 5. Team notoriety – Everyone knows who the Durham Bulls are. I couldn’t tell you how many times people asked me if I worked for the Barons when Michael Jordan played there (No, I did not. I was in high school in Washington when he played for the Barons.) It was borderline annoying, but at least people know who the team was. In college football country, that’s not always easy. The Biscuits have one of the most popular logos in the game. 6. Relationships – Last, but not least. I’ve made some great friends in the Barons’ front office over the years, but I get the sense some front offices aren’t so friendly. Clubhouse management is a pretty lonely profession, you spend many hours each day in a concrete clubhouse by yourself. You’d be surprised how important your relationship with the front office is to maintaining your sanity. They’re usually like-minded baseball people who you can have a baseball conversation with. In a business that is driven by sales, you’re going to meet a handful of “used car salesmen.” I got good vibes from most of the teams that I talked to this winter. I was offered a job at the ’08 Winter Meetings. When I told the somewhat “used car salesman” assistant GM that I was interviewing with that I’d have to think about it. His smug reaction was like, “But we’re the ______ _______! How could you NOT want to work for our glorious team? !” I didn’t accept the job. Veteran free agent clubhouse manager Jeff Perro has announced that he has agreed to terms with the Tampa Bay Rays and their AA affiliate, the Montgomery Biscuits, to be the Biscuits’ home clubhouse manager for the 2012 season. Perro has been one of the most highly sought after free agent clubhouse managers during the 2011-2012 offseason. He had been in contact with many organizations and minor league teams over the past three months. He had been very quiet, however, about which teams he had talked to, until today, when he announced that he was formally offered, and then accepted, the Biscuits position on Monday. In additon to proximity, the other qualities of that Perro listed he had to consider were salary and other financials, quality of ballparks and cities, overall chemistry with the affiliate and parent organization, and other intangibles. Prior to working with the Montgomery Biscuits, Jeff Perro has also worked in the clubhouse with the Augusta GreenJackets, in 2008, and the Birmingham Barons, in 2001, as well as the last three seasons. He has also worked with the Mobile BayBears, and defunct Mobile BaySharks as well as the Mobile Mysticks hockey team in other capacities. Perro will be back and forth between his home south of Birmingham and Montgomery over the next two months to prepare for the upcoming season, He’ll be to flying to Port Charlotte, FL for the Rays’ spring training toward the end of February. From there, he’ll fly back to Birmingham, gather his things, and be ready to begin the 2012 season with the Biscuits. Follow Perro as @MiLBClubbie on Twitter and follow Facebook page for his “Inside the Clubhouse” blog. The Birmingham Barons players, manager, a few front office members and I caravanned to the Red Cross disaster relief center at The Scott School in Pratt City, AL on Monday May 2nd (See Part Two: “How Can We Help?”) to volunteer our time and energy . The following day the Barons’ front office and I (the players left on a road trip to Jackson, TN that morning) were planning to go back to do more work. Coincidentally, The Jacksonville Suns professional baseball team had also planned to stop and work at the relief center on their way from Montgomery to Huntsville. They were supposed to have a game in Huntsville on Tuesday, but it was postponed because Joe Davis Stadium in Huntsville still did not have power. The team could have had a day off, but they chose to help the citizens of Jefferson County, AL. We arrived at The Scott School around noon, and the scene was completely different than the day before, the impending weather undoubtedly kept donors, people seeking aid, and, perhaps, a few volunteers away. Where there was a line of police officers and military patrols the day before, there was one cop, maybe two. There was still work to be done. We made our way to the back parking lot of the school where were people loading and unloading. I spent more time on the unloading donations side than I did Monday. There were individuals dropping off trash bags of clothes, cases of water, and bags of cleaning supplies. There were church vans dropping off racks of clothes and loads of food. There were also individuals and companies from as far away as Wisconsin and South Florida dropping off trailers full of donations. The Red Cross’s system had slightly evolved for the better in a day’s time. Instead of bringing cases upon cases of bottled water into the school, just to bring them back outside, they had just started stacking them behind the school. “How many cases of bottled water do you need? Ok, let me just walk over here and grab one for you.” Much more efficient. Because of the slightly slower pace than the day before, I actually got to have conversations with a few donors and other volunteers. There was a younger guy, he looked barely eighteen, who had pulled his grill trailer from Greensboro, NC to cook hot dogs and burgers for the volunteers to eat. I met a girl who was a student at the University of Alabama. She watched the tornado take out Tuscaloosa from her dorm just a few miles away. The rain began to come down around 2:00. The center slowed a little more, and the parking lot turned to mud soup, but we continued to unload, sort, and load. I had talked to Suns’ broadcaster Roger Hoover earlier in the day, the team planned to show up around 3:00. I was worried that there would be little for the guys to do and they might not be able to grasp the severity and scope of the situation. The Suns’ bus pulled in right on time. I walked over to the area where the Red Cross representatives were briefing Andy Barkett and his team. I found a few players that I recognized and recognized me, shook some hands, and walked them around. The team had been asked to stay out of the cold rain as much as possible. I don’t blame them for that, these guys have careers on the line. You miss a few games with pneumonia, you may get passed up in the organization, and miss your one chance at a big league career. Once again, I do not blame them for that. I was walking with Jeff Allison and Jake Smolinksi toward the back door to explain what we’d been doing. Allison asked if we could see the damage from the tornado. He wanted to see the town out of genuine care and concern and to be able to fathom what had happened. I told him it wasn’t but a block or two away, but I hadn’t tried to walk toward it for fear of getting M-16’d. So, the three of us walked down the road in front of the school a little way, waving or nodding at National Guardsmen on our way, what we saw was unbelievable. From a little ways a way, I saw a roof. It was a roof to a big building, like a church. It looked funny, but we couldn’t quite figure out why. It looked like it was a roof to a building that was over a hill, where the building part was being hidden by the hill, and you could only see the roof. As we stepped over shingles, tree branches, and boards to get closer, you could finally see that the building had collapsed. It looked off because the building was basically gone, the roof had kept it’s shape and was resting on the ground. From about two blocks from the school, you could see houses with half the house missing and a flat part on the top of a hill that once had houses on it. You could also see military vehicles and work trucks of all varieties; debris removal, power, water, and vans to transport workers and volunteers. I went to the Mississippi Gulf Coast three days after Katrina. It was a different scene. In Biloxi, 75% of the buildings were about 75% gone. In Pratt City, 20% of the buildings were 100% gone. I don’t know how to describe it, I’m not trying to be funny, but it was a different level and different type of goneness than Southern Mississippi was six years ago. The two Suns and I turned around, headed back to The Scott School. I had a great conversation with the two about what it was like in Birmingham, what parts of the state were affected, and what we, as a state, were trying to accomplish. When we got back to the back entrance, there was a Ryder truck pulled up to the door of the kitchen. Five or six male volunteers were just beginning to shuttle a truck full of MRE’s from the truck about 30 yards through the mud and into the building. I left my conversation with Allison midsentence and ran to join the chain, not expecting he or Smolinski to disobey orders and follow me. However, they were right next to me a second or two later. The group simultaneous broke their leashes, ran to the line, and started passing MRE’s! What started out as five guys passing a thousand or two boxes inside became five guys, plus me, plus half the Florida Marlins’ AA roster. From that point on, it was open season. The Suns’ players were in the rain, walking through the mud, loading and unloading cars. Before too long, my body had had enough of the cold rain and I had to walk inside to warm up. I started a talking to one player about what had happened in Pratt City, Tuscaloosa, Pleasant Grove, and Fultondale. That one player turned into two players, then three, and before long, I was talking to about ten guys. Talking to the Jax team was completely different than talking to my team. My guys had been through it, seen it all unfold on the the local news, they had rode buses through these towns and had at least seen signs for the cities that were on their tv’s being destroyed by Mother Nature. The Suns hadn’t. They hadn’t seen much of anything on the news, they didn’t know which areas were hit or if Regions Park had sustained any damage. They were totally interested in what was going on and listened to every bit of the information I gave them, it was the first they heard of it. Despite knowing nothing about the situation or the people affected, they were genuinely enthused and wanted to help in any way they could. It’s great that you want to help, it’s awesome that you want to carry boxes and get sweaty in the heat or muddy in the rain, but you being here is doing two things that you may not be able to see. You’re showing the citizens in this community that there are people outside of the area that you are from somewhere else and you care and know what’s going on. You’re also talking to your people back home (or in Jacksonville) and telling them about what’s going on and making them aware of the difficulties and the need. Those two things are huge because this situation was buried by and wedged between the royal wedding and the death of Osama bin Laden. The Jacksonville Suns and Florida Marlins have all my respect after Tuesday. Not just for the work that they did, not only because they sacrificed an off day for us, Birmingham citizens, but also because the chose to get rained on and muddy in their street clothes, two hours from a shower and change of clothes at the hotel in Huntsville. Thank you, gentlemen. This is part three of a three part series about the effect the tornadoes that swept the South on April 27th have had on baseball and the communities in the area.